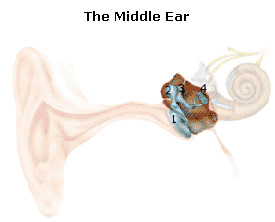 The vibrations from the eardrum (1) then pass into the middle ear, which contains three tiny bones: the hammer (2), the anvil (3), and the stirrup (4). These bones are the tiniest in the human body. 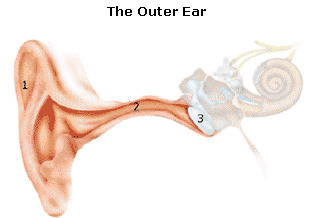 The sound vibrations then pass through a memebrane called the oval window into the fluid of the inner ear. 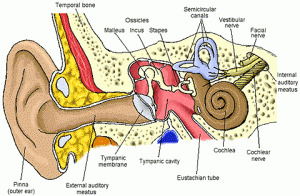 A tube at the bottom of the middle ear, call the Eustachian tube connects to the back of the nose to control the air pressure. 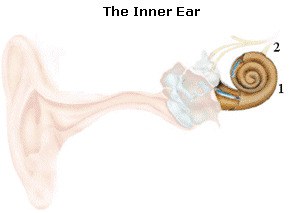 When the sound waves reach the inner ear, they enter the cochlea (1), a system of tubes shaped like a snailshell. the cochlea is filled with a watery liquid which moves in response to the virations within the oval window. As the fluid vibrates, 25,000 tiny nerve endings are set in motion. These movements are converted into electrical impulses along the auditory nerve (2) to the brain. The brain then interprets these signals as sound.